Panthers LE Charles Johnson is dealing with a hip-flexor injury and his future status is unknown at this point. This is just another reason for owners to think about dropping the vastly underperforming DE in shallow to moderate sized leagues. Chad Greenway missed last week's game with a combination of rib and hand injuries. He is also expected to miss Week 5. Gerald Hodges will continue to fill in for him and play every down. Bruce Carter exited Sunday Night's game with a quad strain and did not return. He's not expected to play this week, so look for some combination of Anthony Hitchens and Kyle Wilber to take his place. Falcons SS William Moore exited Sunday's Week 4 game against the Vikings with a shoulder injury and did not return. He was placed on IR/designated to return list. He will be eligible to play again come Week 13. Second-year safety Kemal Ishmael took his place. DT1 Kyle Williams suffered a knee injury against the Texans. He is still being evaluated. We should hopefully know more in the next day or two. Bucs FS Dashon Goldson was forced from Tampa's Week 4 game against the Steelers with an ankle injury and did not return. Goldson went down in the first quarter, but wasn't officially ruled out until after halftime. Rookie safety Calvin Pryor left Sunday's game with a thigh injury. Jaiquawn Jarrett filled in for the rest of the game. DB1 LaRon Landry was suspended 4 games for testing positive for PEDs. It's a big blow for a lot of fantasy owners who were banking on the consistency Landry is able to provide. However, I can't say I'm shocked by this news given his physique. After seeing a huge decrease in playing time in previous weeks, Roman Harper was back to playing every down. This is an encouraging sign. It may be time for us to start trusting him again in our starting lineups. Despite a very strong preseason, Jerry Hughes' continues to struggle on-the-field and in the box scores. Playing undersized means he has to be near flawless in his technique which he hasn't been so far this season. He will either need to fine-tune his approach or develop another pass rushing technique fairly quickly if he hopes to salvage his season. 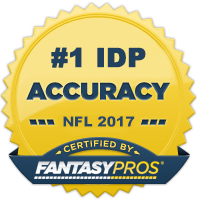 DE Michael Johnson (TB) - Johnson was a top 20 draft selection at his position in the majority of IDP leagues heading into the season. However, an ankle injury cost him two weeks and caused him to be dropped in some leagues. He bounced back well against the Steelers with two sacks. Considering how thin the waiver wire is at this position, Johnson should be one of your upper priority choices if you need help at the DL position. DE Anthony Spencer (DAL) - Spencer is on this list as more of a long-term stash than an immediate performer. Last week was his first back in action in over a year as he was working his way back from microfracture surgery. He recorded 3 tackles in his debut, but that was on a limited snap count. Expect the Cowboys to ramp up his playing time quickly as they desperately need an infusion of talent along the defensive line. He can pay off for owners down the stretch who are struggling to fill their third defensive line position in 12 and 14 team leagues. DE Cameron Heyward (PIT) - Heyward had a breakout season last year and has carried over that success into 2014 to a certain degree with 14 total tackles and 2 sacks through the season's first four games. The matchup this week against the Jaguars is fantastic as they are giving up a league-leading 5 sacks per game. That said, Heyward has a 60-70% chance for a sack and decent tackle numbers this week. WILB Donald Butler (SD) - After a excruciatingly slow start to the season, Butler has rebounded in the last two weeks with 19 total tackles and a forced fumble. He gets the Jets this week who have been an absolutely great matchup for tackle-reliant linebackers. With Manti Te'o out with an injury, Butler should be free to lead the team in tackles. Double digit tackles are in his sights. SILB Prince Shembo (ATL) - Shembo has taken has officially secured the starting ILB job over Joplo Bartu. He has a good chance at becoming a near every down player. He posted 8 tackles last week against the Vikings. He's got limited upside but may serve owners well as a spot start LB3/4. SILB Keenan Robinson (WAS) - Robinson was on a mediocre pace through the first three weeks of the season. That all changed on Thursday night however as he posted 13 total tackles, an INT, and a PD. He's not playing at a superb level, but he's clearly been better than Perry Riley and should continue to see good tackle opportunity. Not only will he get the added benefit of the home stat crew this week but he also plays against the Seahawks who have given up the 4th most points to linebackers this season. Very nice start in Week 5 and solid LB3+/LB2- the rest of the way. MLB Tahir Whitehead (DET) - I toiled back and forth between Gerald Hodges and Whitehead as a last minute LB3 fill-in for a couple of my leagues last week. I eventually decided on Hodges, but that turned out to be a mistake. Whitehead finished with 11 total tackles (tied for the team lead). Granted the Jets matchup helped buoy his stat line, but he's still not playing up to level he's capable of, so there's room for his value to grow. Consider him a LB3 with upside. WLB Danny Trevathan (DEN) - This is just a reminder that Trevathan is due to return this week from injury and should be picked up in virtually all leagues that have a bench. He may get eased back in this week and not play a full complement of snaps and/or share time with Brandon Marshall, but don't expect that situation to last long. Once back to an every down role, Trevathan should post top 10 linebacker numbers. SS Tony Jefferson/Rashad Johnson (ARZ) - This is just a reminder that both Arizona safeties have been producing at a steady clip and are available in a good amount of leagues still coming out of their bye week. With Deone Bucannon and Tyrann Mathieu waiting in the wings, it's unclear how long these incumbents will continue to possess this level of fantasy value. But they are both worth picking up and riding out for as long as they continue to start. SS Brandon Meriweather (WAS) - Meriweather has been productive since his return from suspension with stat lines of 5-1 and 6-7. He's put up these type of numbers in the past and the SS spot in Washington has traditionally been good from a tackle standpoint. He should be a fairly safe play at home this week. Lock and load him as a DB3. SS Reshad Jones (MIA) - Jones is finally off suspension but is on bye this week. That said, he's still worth a pickup in the majority of deeper leagues. Jones compiled over 80+ solo tackles last year and with the Miami linebacking crew a mess right, I expect even bigger numbers. CB Brandon Flowers (SD) - Flowers had 4 solos or more in each of his three games this season and has added 3 PDs and an INT, to boot. The Jets matchup this week isn't elite, but is above average as they have allowed the 12th most points to cornerbacks so far this season. For those in CB-required leagues, he's a worthwhile pickup as a CB2/CB2+.